What is your reaction to the violent protests over the New Year killings? What started as a very peaceful demonstration by the students of Benue State turned into a rowdy situation, but I understand; I can feel the anger of the people. Even as a leader, I had to control myself when I saw the level of damage that was done against my people. But in situations like this, the simple message I try to pass to the youths and everybody in Benue State is that they should remain calm. This government is proactive and will continue to ensure the security of lives and property. The promulgation of open grazing law was an initiative of the Benue people and it’s a very popular law. For us, that is the only way we can ensure peace for farmers and herdsmen to coexist and live together. Are you saying the killings were as a result of the anti-open grazing law your administration enacted recently? Ranching is the global best practice and there is no alternative. I want to appeal to my people to remain calm. In a situation like this, you cannot think of reprisal or anger as a solution to the problem that has been caused. Let us continue to be law-abiding and ensure that the perpetrators are brought to book. I have reported this to the President. I have reported this to the security agencies and they are working towards it. I have repeated my call that the leadership of Miyetti Allah Kautal Hore should be arrested. I had earlier given this notice to the security agencies and reported these people to the Presidency because they came out boldly and said they were going to resist the law and that they would do everything possible to sabotage what we are doing. How far has the government gone in calming frayed nerves? Right from yesterday (Tuesday) when we got wind of this incident, we did not waste time. I had to break from our security council meeting and I personally visited two scenes of the incidents in Guma and Logo local government areas. I was supposed to complete the remaining two scenes today but, unfortunately, I have run out of time now but we have already, with the security council, done deployment to all the places and I appeal to people not to run away from their villages until we are able to handle this. Why are you insisting on the arrest of the leadership of Miyeitti Alla Kauta Hore? I think the right thing to do is for the Federal Government to rise to its responsibility and arrest the leadership of Miyetti Allah Kautal Hore. They did not hide their feelings because they came out openly and threatened to frustrate the law. If the Federal Government does not do this, they are telling us that we are not part of Nigeria and it would be unfortunate because it is the responsibility of the Federal Government to provide us with security. The security apparatus of this country belongs to the Federal Government and they have the capacity. These people are known, I have reported them to the President and currently, they have taken us to court. They issued several press statements and threats against us and their threats have become reality. They are living in Abuja with the Federal Government so why can’t the Federal Government do something? They are throwing us into a state of anarchy, which is wrong. We have done everything to ensure that peace prevails here. I want to assure everyone living in Benue that we will continue to protect them, provide security for lives and property. Let us restrain our anger, although it is painful. I understand and feel the pains of Benue people. I feel the pains of Benue youths. I feel the pains of mothers. I feel the pains of fathers whose relatives have been murdered in cold blood but I want to assure them that justice will take its course. This law remains a law in Benue State and there is no going back on it. 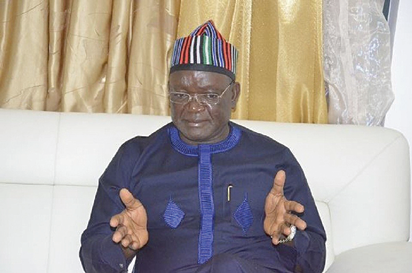 The perpetrators must be brought to book and I can assure you that Benue will be well. There is a debate going on about community policing. Does the current security situation in Benue make you see the need for state police in the country? Concerning the issue of state police, I remain committed to democratic principles. It is not for me to decide whether we should have state police or not but if the people, the stakeholders of Benue State, agree to do it, I will have no objection to having state police. But this is something that has to be subjected to a debate and we will get the inputs of all stakeholders so that we can weigh the various options. Whether state police or federal police, what is important is for the police to enforce the law. That is what I am saying. The police must enforce the law. There should be no sacred cows as we are seeing today. I have reported Miyetti Allah Kautal Hore, their president and secretary — these two persons who persistently alerted us that they were going to come after Benue State to cause havoc and they have done it. I am repeating that call; if there was another place where I could take my case, I would do it. I have no option but I reported this to the President yesterday (Tuesday) and he assured me that he would get the Inspector General of Police to act and I believe that that will be complied with and until that is done, I am not going to rest. Aside from the communities that were attacked in the last two days, are there new ones that have been attacked? Like I said yesterday (Tuesday) we visited Tomatar, where a lot of people were killed. This is also part of Guma, but on the other side of the river. I visited Azege in Logo LGA, where people were also killed and some wounded. I also visited the temporary refugee camps in Tse Abi and Agenke in Guma LGA and Ayilamo in Logo. There are two other places that were also attacked in Umenger, Guma LGA. This is the other side of the river and also in my council ward, in Ako. These are the two sites that I have yet to visit but I intend to do so. Here too, people were wounded and killed; I have yet to get the full brief from there. While you were going round to inspect some flashpoints in Tomatar yesterday, you reportedly came across some bulletproof vests with the colours of the Army. How true is this? Regarding the bulletproof vest, I was told but I have yet to see them. I’m waiting; it was when I left that I received a phone call, but in situations like this, you don’t act on rumours. I’ve heard a lot of things but I’m waiting to confirm because it coming from me will mean that it is authentic information and you have to be careful what you say as a leader, otherwise you will create other challenges which you may not be able to control. The youths that were protesting the killing of their brothers, mothers and fathers nearly mobbed you. Is this a rejection of your leadership? On the incident this afternoon (Wednesday), you could feel the anger. You could see the anger of the youths, I also feel the pains. I’m also angry but the Bible says be angry but do not let the sun go down on your wrath. So, even when you are angry, you have to find a way of controlling it, otherwise, you will mess up yourself. That is why I’m appealing to youths, for it is said that two wrongs cannot make a right. We can’t solve this problem by creating another wrong. Government is on top of the situation as of today. Yesterday, the security council met. It was as a result of the blockage that the security council decided to move to the scene and appeal to the youths to allow free movement but it became rowdy. Like I said, these are very sad days for Benue State. Corpses were brought to the mortuary. When we visited, more corpses were being brought in and even today more corpses were discovered. So, you can see the anger of the people and that is why government must act. One thing that will give the people confidence is when the president and secretary of Miyetti Allah Kautal Hore are arrested and prosecuted because there is enough evidence of what they’ve done and I am accusing them directly. I expect that to be done and since I have reported to the President, I’m waiting to have a response from the security agencies because people should not operate with impunity. If we do that and everybody decides to take the law into his hands, then we are calling for anarchy and you don’t know the extent that can go. Challenges are meant to be overcome and I believe that God will help us to definitely overcome this and I believe that tomorrow, those who are resisting this law will celebrate the law for there is no way of moving forward arising from the challenges that we have today in Nigeria on land. The land is no longer there and I will continue to say it. We are farmers and there is no way we can surrender our land again for grazing but all business people who are willing to go into cattle rearing business are free to obtain permits and do ranching in Benue State.